Anyways, back to the story. Akainu’s still alive no duh, and since Ace still lives the admiral is about to give him the final blow when Jimbei comes and blocks the hit. 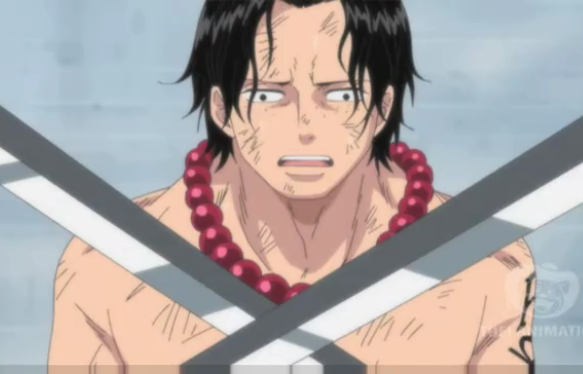 The rest of the episode consists of Ace’s last words to Luffy just before he dies, as Luffy himself enters a state of shock and doesn’t want to believe that Ace will die. 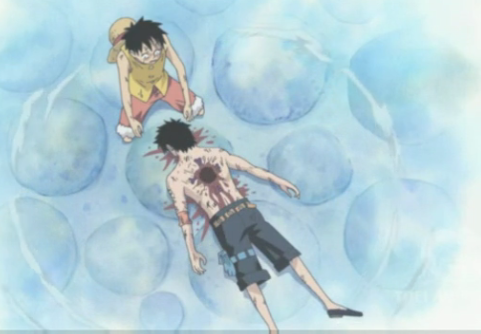 In the end, Ace falls from his wounds and as he dies Luffy starts crying and yet he sounds like he is laughing at the same time he’s lost it. For Luffy it must have been incredibly hard on him, though. Since One Piece started Yes, that’s a long way back, I know, Luffy has always been completely carefree and during intense moments when he saved his friends he always managed to save them in the end and no one ever died or even had wounds that couldn’t be healed completely. Luffy was always someone that managed to save the day, or a miracle always happened and everyone would live. This time however, he must have felt extremely powerless because for the first time in his life he couldn’t protect the person he wanted to protect, and so he entered some kind of shock state and can’t do anything else but laugh/cry. This is a really important turning point in the story. I was always under the impression, since One Piece started, that it was impossible that someone would die completely, but this time Ace really died and that moment was really intense, since it was a very important character. 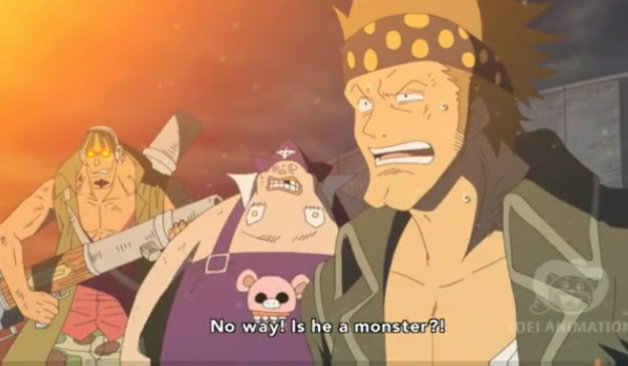 Tagged anime, episode 483, one piece, review. Bookmark the permalink.